Children, the elderly and those with respiratory conditions such as asthma, lung disease and heart disease are most at risk for harmful impacts. Limit your time outside and stay indoors as much as possible. Brad Sherwood stepped out of his Santa Rosa office shortly after noon Thursday and was stopped cold. Smoke from a faraway wildfire had blown into Sonoma County, reviving the horror he experienced 13 months ago — to the very day. The foul odor of burned trees, homes and possessions more than 100 miles away packed a visceral punch. His Larkfield home, destroyed by the Tubbs fire — the most destructive blaze in California history — is under reconstruction, but the fire’s overall toll will take much longer to repair. An unwelcome sense of deja vu blanketed the area devastated by the North Bay wildfires on Oct. 8, 2017, and Sherwood’s angst was shared by other fire survivors and people whose sense of well-being was shaken to its core. “No, no, no it can’t happen again,” Sue Decker said, recalling her thoughts as she spied the smoke pouring in from the east while driving up from Cotati to Santa Rosa. Her Fountaingrove home, heavily damaged by the Tubbs fire, was among the more than 5,300 Sonoma County homes ruined in last fall’s conflagration. By chance, Thursday was Decker’s birthday, and she and her husband Jim had booked a getaway to Las Vegas, where they found comfort in the distance from the flames in California. A sunny morning suddenly went sour Thursday as smoke from the Camp fire, burning more than 100 miles northeast of Sonoma County near Chico in Butte County, turned the skies ominously brown. Emergency dispatchers fielded calls from worried residents and local fire agencies dispatched 10 engines to Paradise, carrying about 40 crew members drawn from departments throughout the county. Butte County firefighters helped battle last October’s firestorm in Sonoma County, Santa Rosa Assistant Fire Marshal Paul Lowenthal said. Sherwood, who is on the Mark West Union School District board, said he was glad to learn that students at Riebli Elementary School — including his two children — were eating lunch inside and that counselors had been called to the school. “I kind of wish I was with them now,” he said. Santa Rosa Junior College and Sonoma State University on Thursday afternoon canceled classes and activities for the rest of the day. Both colleges subsequently canceled all classes and activities Friday. The smoke cast a pall over the streets in downtown Santa Rosa, dampening spirits of people who witnessed the three-week siege of fire a year ago. “Just a lot of your normal PTSD, (a feeling) that it will happen again,” said Marie Rich, 25, of Rohnert Park, heading for class at the University of San Francisco campus in Santa Rosa. Rich said she knows two families who lost their homes in Coffey Park last year. “I can’t imagine how they’re feeling now,” she said. Ralph Morgenbesser, 77, was manning his hot dog cart in Old Courthouse Square. Morgenbesser’s home near Memorial Hospital was untouched, and he took in people displaced by fire last year, offering food and showers. A fixture on the town square, Morgenbesser said he had friends who were forced to flee in the night, given no chance to take valuables with them. Sonoma County Supervisor Lynda Hopkins said she saw ash falling in Santa Rosa and Forestville. “Driving around west county today takes me right back to October 2017,” she said. Hopkins said she was “sending thoughts and prayers to all in Butte County,” especially state and local firefighters and to Sonoma County fire agencies sending mutual aid. Laura Strom, a marriage and family therapist familiar with fire-related trauma, said residents are likely feeling a little panicked by the darkened skies and acrid smoke. “It’s important to take some long, slow deep breaths, to shut down the escalating anxiety reaction in the sympathetic nervous system, and remind ourselves the fire is far away from us now,” Strom wrote in an email. Even so, Strom said residents could take some steps to prepare for an evacuation in the event of a nearby fire. “This can help people to feel they aren’t powerless,” she said. 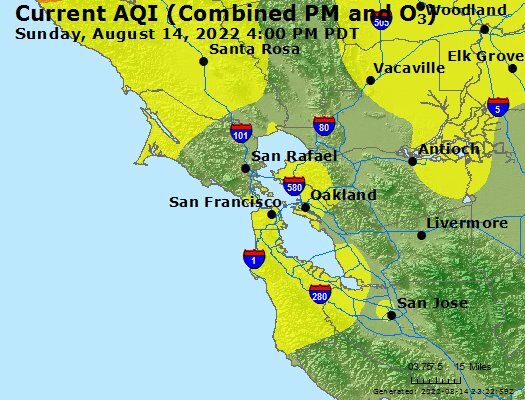 The Bay Area Air Quality Management District issued an air quality advisory continuing through Friday afternoon, noting that it could be extended, depending on weather conditions, spokeswoman Kristine Roselius said. Residents were advised to stay indoors with the windows closed when possible. Staff Writer Martin Espinoza contributed reporting. Staff Writer Guy Kovner can be reached at 707-521-5457 or guy.kovner@pressdemocrat.com. On Twitter @guykovner. Staff Writer Hannah Beausang can be reached at 707-521-5214 or hannah.beausang@pressdemocrat.com. On Twitter @hannahbeausang.